Together For Change – Communities, Ideas, Action, Change! Together 4 Change aims to be a key catalyst in bringing about positive change in the lives of people who have social or health needs. The members of our online communities constantly share what is happening to them. We work together with our members and others to try and improve things by providing a space for mutual support and by developing projects from the things we learn on these networks and advocating for policy and practice changes. 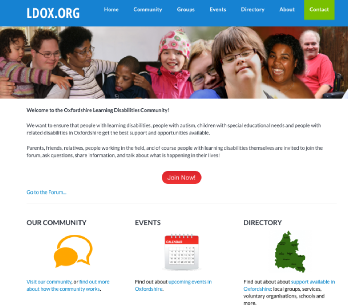 LDOX is a Learning Disabilities Community for Oxfordshire. People from Oxfordshire are invited to ask questions, share information, and talk about what is happening in their lives. 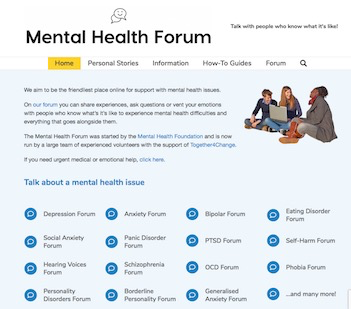 The Mental Health Forum aims to be the friendliest place on the web to discuss mental health issues. It has received over 2 million visits during the last year and is run by a team of volunteers. 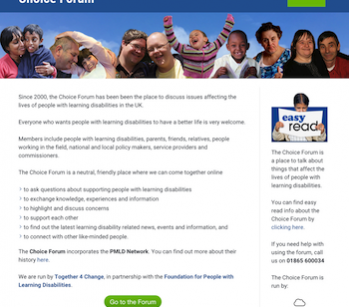 Our UK Learning Disability Forum, the Choice Forum, discusses issues affecting people with learning disabilities. Family members and paid staff share experiences to make a difference for people with learning disabilities.